How was your weekend? I wish I didn’t make and eat all of these before our Mother’s Day brunch, because I know how much everyone would have enjoyed them. Sorry mom. My kids also gobbled these up which is great since they are packed with fruit and veggies. The muffins, not my kids. Also, this is a one bowl deal. Less mess is always a plus is my book. Easy, delicious, healthy, and dare I say… Moist! EEEEEEEEK, I can hardly type it without cringing. Promise me you’ll make these as soon as humanly possible? You won’t be sorry. 1) Preheat oven to 375 degrees. Grease a muffin tin with paper liners, or spray with nonstick baking spray and set aside. In a large bowl add the eggs, oil, banana, and honey and whisk until well combined. Add the sugar, salt, baking soda, and cinnamon and whisk again until throughly mixed. 2) Add milk, carrots, and apple and stir to combine. Add the oats and almond meal and stir. Add flour and stir until just mixed. 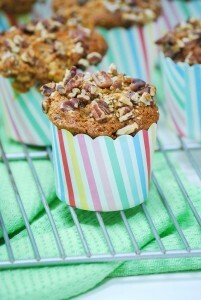 3) Fill muffin tins 3/4 full and top with chopped pecans and hemp seeds. Bake for 30-35 minutes, or until a toothpick inserted into the center comes out clean. OK I had the privilege of eating one of these muffins and I can’t stop thinking about how delicious it was. In fact I am sitting at my desk right now with a cup of hot water and lemon and only wish that I had one of these amazing muffins to gobble down this very second. Another great recipe look forward to making them. Typically for regular sized muffins I bake for 18-22 minutes, and for minis I bake for about 12-15 minutes. Better to start checking them early then add an additional minute until done! I know we’ll LOVE THESE! Cute measuring cups ? Thank you! And yes, I think you will love them!